1. Thermometers with contactor have made possible the automation of temperature control and increased the safety of energy consuming. 2. 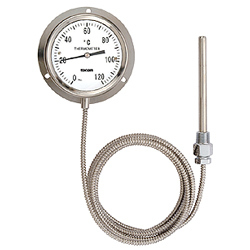 Electric contact acts as a switch control that follows the dial value on the thermometer. 3. The pointer can be adjusted to send signals for the contactor to switch on or off. 4. Thermometers equipped with this optional feature will turn alarm signals "on" or "off" automaticaly when the adjusted value is reached. 5. And where appropriate relays are incorporated in the installation circuit, contacts will turn "on" or "off" electric motors, heaters, valves, etc. 1. Case material: AISI 304. 2. Material of sensitive stem: AISI 304 or AISI 316. 4. Capillary length: standard 3M, max. 15M. 5. Contactor type: one contator type/ two contactor type external adjusting method. 7. Applications: transformer dyeing, drier, food processing, boiler, air conditioning equipment, and other industrial machines.